I bought an affordable spotting scope last week and it's a keeper. 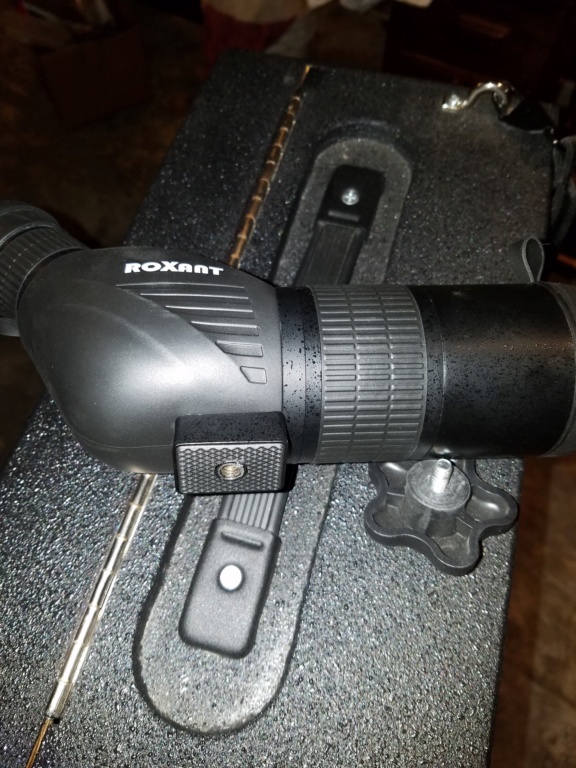 My problem is the attachment on scope is directly to the body of scope (no rotational band mount like on pricey scopes) and to the Gil Hebert bracket on the box. 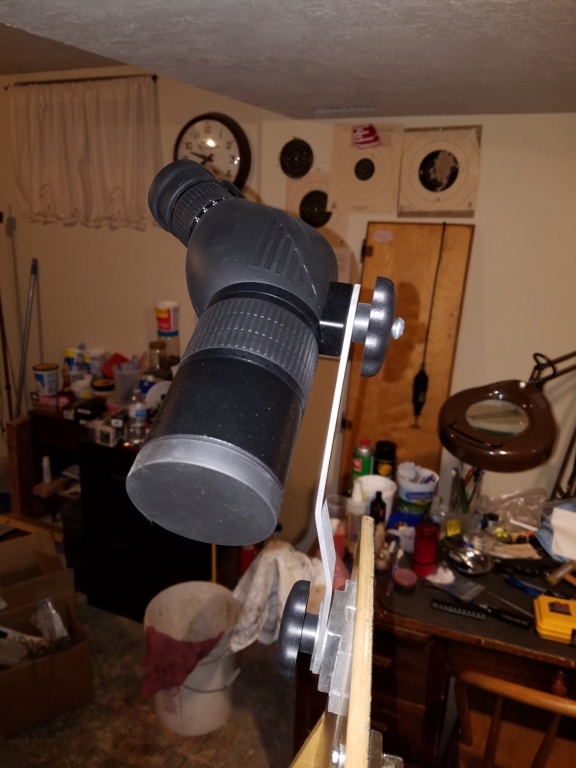 This doesn't allow the scope eyepiece to rotate to my head position. Have any of you dealt with this and how did you fixed it. post a pic of your scope please. Finally figured a way to get picture from cell phone to computer, I'm a real bozo with techno-geeky stuff. This is what I got Chris, there's hardly any room to put a big band clamp around it. The wide area with the ribs is the focus ring. I'm thinking my only option might be with an extended arm or see what ram mounts has . It's aluminum. Twist the mount till it is where you want it. I suspect you don't store it mounted to the arm. To be clear I am talking about twisting the arm. Don’t do anything. There is nothing wrong with how you have it mounted. That is exactly how mine is. Raise it to eye level and look into it by leaning without changing your stance. You don’t need to position it so you look “down” into it at all. That moves your head position. Looking into it sideways preserves your stance. Right handed, box on left, assume stance, level and center scope to your sighting eye, shoot, lean your body/face forward into scope eyepiece, view target, lean back into shooting stance, repeat. Will, your right, I need to level the scope to eye height, and to do that I'll need a longer arm. Thanks guys. Make a “riser” for your shooting box. “1x” dimensional lumber will do. Gussets on the corners to provide stiffness.